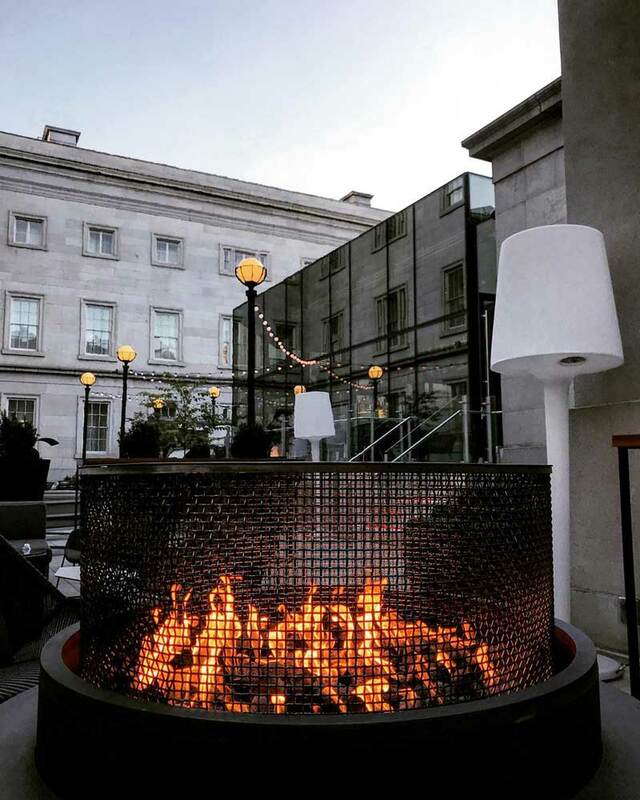 When the temperatures dip, these DC bars and restaurants heat up with fireplaces, outdoor fire pits and more. 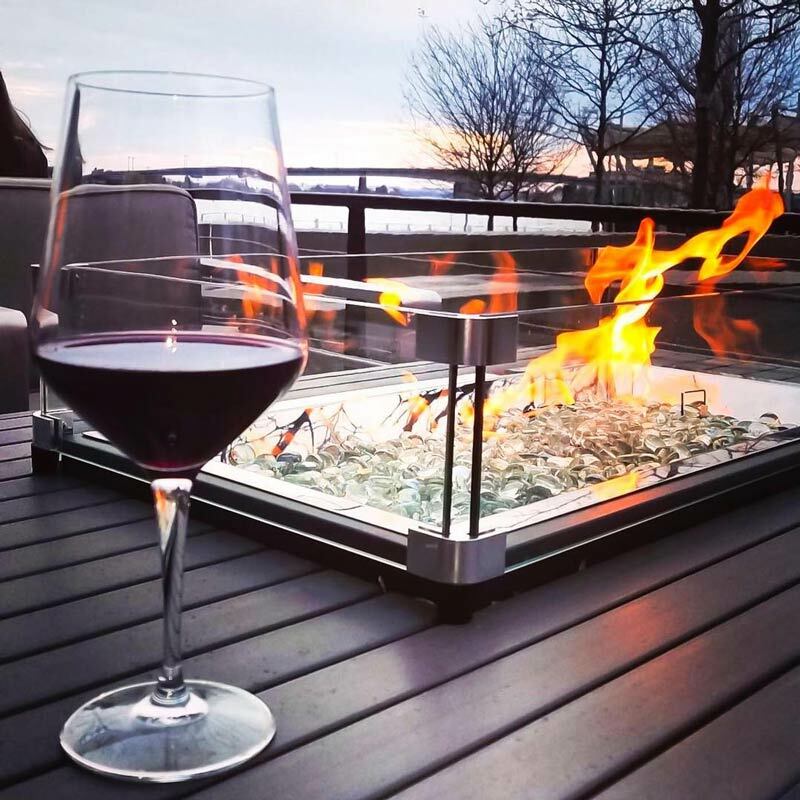 If you’re not fortunate enough to have a fireplace at home or space for a bonfire in the backyard, no worries – these bars and restaurants in the District have you covered with roaring fireplaces, warm wood-fired ovens and outdoor fire pits. So mosey on over to these prime spots for getting cozy, shake off the brr of fall and winter and warm up with an open fire and dishes and drinks sure to satisfy the appetite. 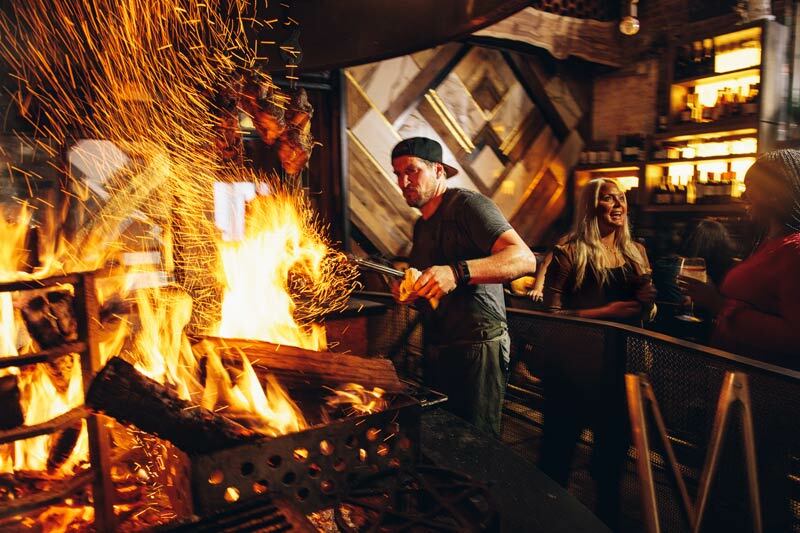 At Maydan, Bon Appétit's second-best new restaurant in America in 2018, the roaring flames from the copper-topped, oak-fired hearth are the star of the show. Discretely set in the back alley of a 19th century building off 14th Street and marked only by a heavy wooden door, the two-story Maydan will warm you up on even the coldest of days with a menu that tells the story of the restaurant team’s travels across the Middle East and North Africa. Imaginative cocktails are mixed with the likes of cardamom, paprika and sumac, while lamb shoulders dressed in Syrian seven spice and beef-with-saffron-kebabs crackle over the fire. This upscale restaurant set in a Federalist home exudes cozy elegance. Request a table in the John Carroll Room, which comes equipped with a roaring fireplace and an all-American ambiance that's perfectly suited for an important date or dinner. Revel in seasonal fare like gnocchi made with Burgundy truffles and keep the cocktail menu close at hand for creations like the apple brandy-infused Autumn Sidecar. 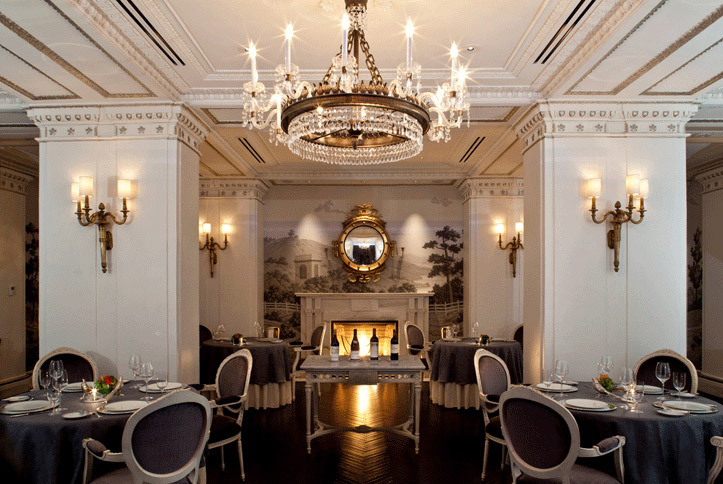 This Michelin star recipient inside The Jefferson Hotel lures diners in to the main dining room with a roaring fireplace, snug nooks perfect for a romantic evening and an elegant menu inspired by the harvest from Thomas Jefferson’s Monticello with a wine list featuring more than 1,300 offerings. Plume also offers patrons private alcoves to enjoy the prix fixe menu outside of the main dining room. 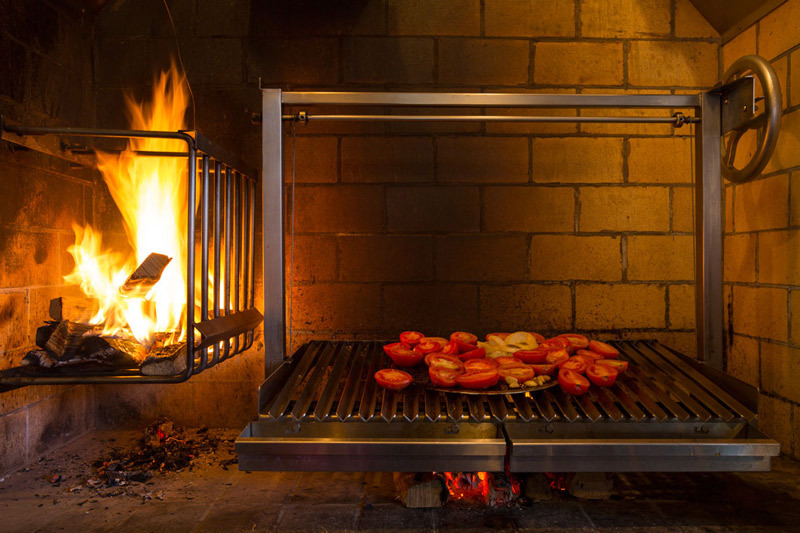 The hissing fireplace at this timeless, romantic restaurant sizzles three feet off the ground, as you enjoy delicately cooked Mediterranean fare. The historic confines were once the home of General Nelson Miles, a former Secretary of the Army. The restaurant’s decadent courtyard is adorned with wisteria, Edison bulbs and (of course) a fireplace that allows for nearly year-round dining, giving the eatery another cozy lounge area. Officina – “workshop” in Italian – is Michelin-starred chef Nicholas Stefanelli’s masterpiece and the place to be for all things Italian cuisine. 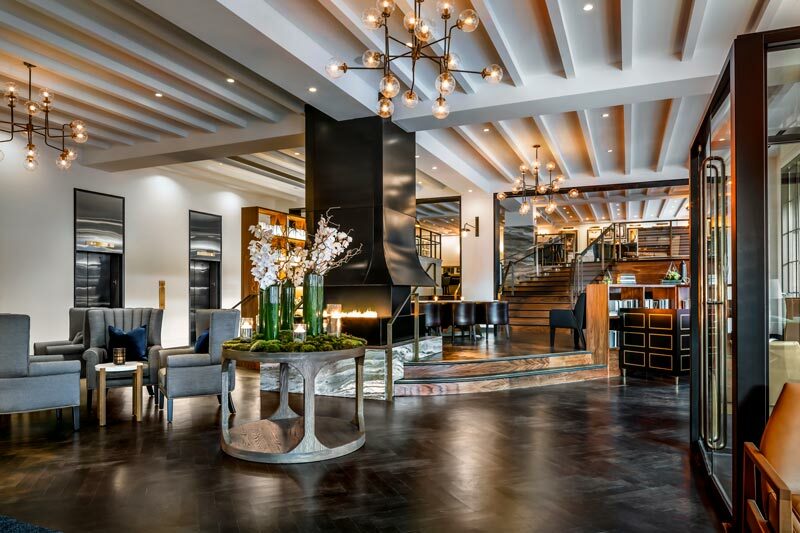 The extraordinary complex at The Wharf is home to an all-day cafe, a gourmet market, a casual Italian restaurant, a “library” devoted entirely to amaro and Terrazza, a year-round rooftop bar. 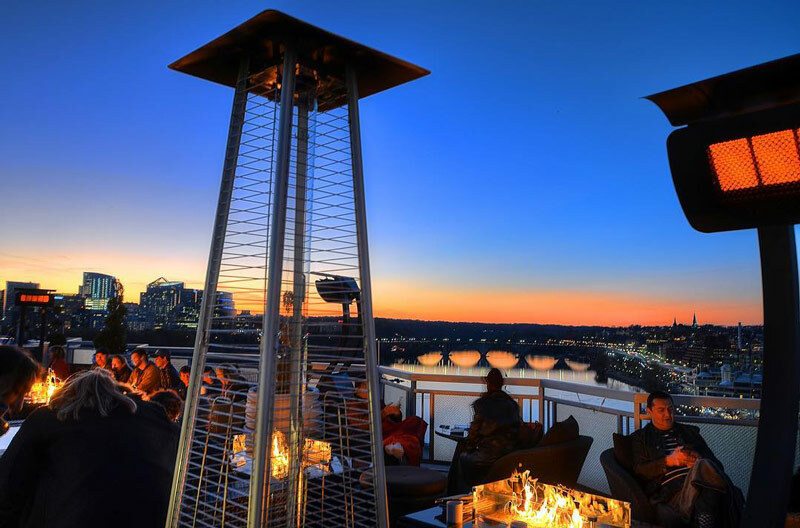 Eat your way through this culinary playground and cap off your night with views of the Potomac River and a cocktail by the cozy fire pits at Terrazza. This neighborhood restaurant delights visitors with an in-view wood-burning stove, decor reminiscent of a rustic farmhouse and an Italian-influenced menu featuring delectable pastas, like the ricotta cavatelli with spicy lamb sausage. In true neighborhood fashion the Red Hen accepts walk-ins, but we also recommend cozying up to the open bar and sipping from the exceptional wine list of this Bib Gourmand honoree. Top of the Gate, one of the District’s most popular rooftop bars at The Watergate Hotel, blends fireside vibes with Instagram-worthy views of the city skyline and nearby Arlington, Va. Lace up your skates and take a turn around the rooftop’s synthetic skating rink, or if you’re more into lounging, warm up by the fire pits for the ultimate chill experience. An a la carte snack menu and seasonal cocktails both warm and cold (think spiked hot chocolate and mulled wine) complete this cozy winter wonderland experience. The Hilton brothers’ ode to a bygone era oozes coziness as the temperatures drop. Come in from the cold to the 1920s-themed Gaslight Tavern just off U Street and the first thing you’ll see are the wood-paneled walls accented with blue and gold wallpaper and – of course – a roaring fireplace. The Prohibition-style speakeasy keeps the vibes going on the glass-enclosed patio with, yes, another fireplace. For your indulgence, savor a fresh take on classic drinks (Sazeracs and old fashioneds are a must) and ultimate comfort food dishes like braised short ribs and poutine. Savor the atmosphere of a French country inn in the heart of Georgetown. A central stone fireplace makes La Chaumière a must-visit for those who enjoy a rustic and romantic setting. The menu is filled with French specialties and a variety of red and white wines. It all adds up to refined coziness in one of the city’s most historic neighborhoods. Don’t let anyone fool you – sangria is a pleasant sipper even in chilly weather. That is, as long as you have blankets, heat lamps and a fireplace close by. Thankfully, this Spanish wine bar and restaurant on 14th Street does. Go light with cava and Spanish cheeses or heavy with a Rioja and paella, either way you’re in for the royal heat treatment. Pull a chair around the fire, order some s'mores and tell a story on the patio of Bourbon Steak. The outdoor fireplaces, the crowd circled around the pit, and meticulously perfected cocktails mean you’ve finally found an enchanting outdoor retreat. Bourbon brings a southern twist to the classic American steakhouse cuisine while the bar offers both classic and modern cocktails in a plethora of styles. Set against the idyllic backdrop of the Potomac River on the Georgetown waterfront, the year-round outdoor patio at Farmers Fishers Bakers is the perfect spot to warm up by the fire while the kids skate at Washington Harbour’s ice rink (which is open mid-November until March). Cozy entrees at this farm-to-table restaurant include steaming mussel pots, the Mad Pig jambalaya and plenty of delightful house-made pizzas. Sophisticated, New American fare like oven-roasted pork chops and jumbo lump crab cakes with a bourbon corn succotash make any experience at the Blue Duck Tavern memorable. But ask to be seated next to the kitchen, outfitted with an open-flame oven, and you’ll have a new appreciation for the food artisans at work. Sit back in the handcrafted furniture and enjoy seasonally themed cocktails. Bonus: this farm-to-fork eatery is the District’s only Michelin-starred restaurant that serves breakfast, lunch and dinner (not to mention a top-notch brunch menu). Sure, you’ve probably heard of Chez Billy Sud, a tiny jewel box of French cuisine that Michelle Obama frequented, but did you know the restaurant has a sister wine bar, Le Bar à Vin, just across the patio? The 50-seat abode radiates comfort on a chilly fall or winter day, and that’s not just the warmth from the fireplace that you’re feeling. Velvet-covered walls with wood paneling and dark-stained hardwood floors set the mood as you cozy up to the glow of the fire with a glass of vino and graze from the small, but mighty, snack menu. Ivy City, a small neighborhood located just north of Union Market near the U.S. National Arboretum, is gaining major buzz in the District. Tantalizing smells of savory smoked meats emanating from the Tavern at Ivy City Smokehouse make this Bib Gourmand restaurant and bar a must-visit when in the area. At the center of the rooftop patio is a large, gas-powered fireplace – perfect for pre- or post-dinner drinks. 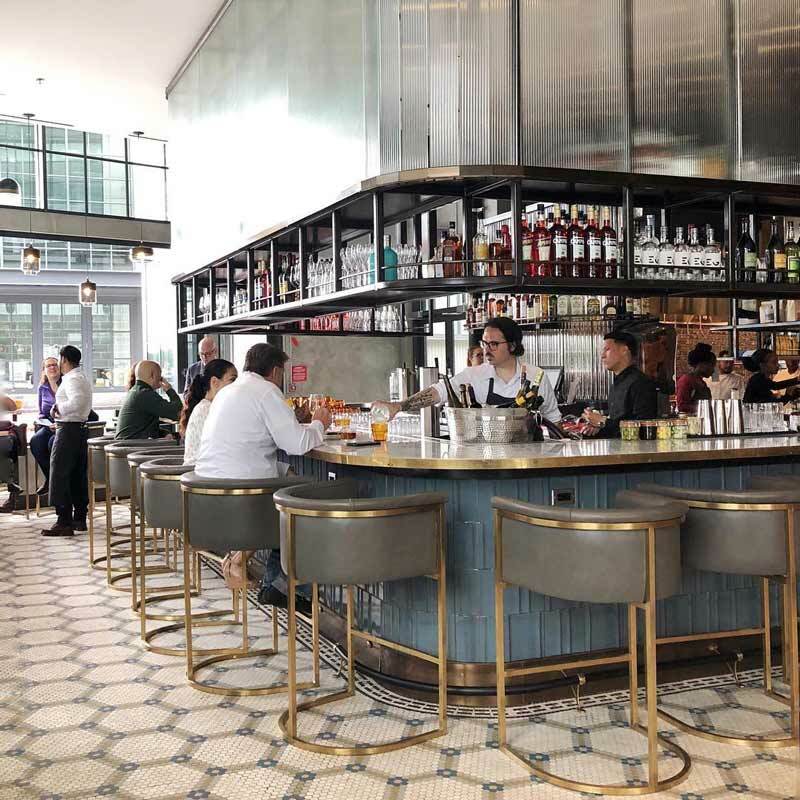 This distinctive restaurant and bar in Chinatown, which blends Gotham-inspired decor and classical architecture, is home to an open-air courtyard with fire pits, as well as a fully enclosed patio for when even a fire doesn't do the trick. 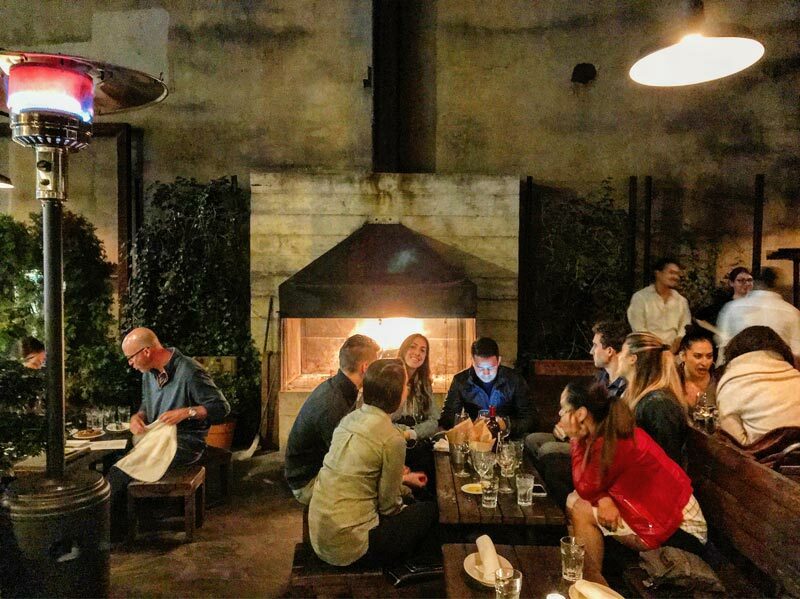 During winter, the outdoor patio is transformed into the Dirty Habit Firescape, complete with warm libations. 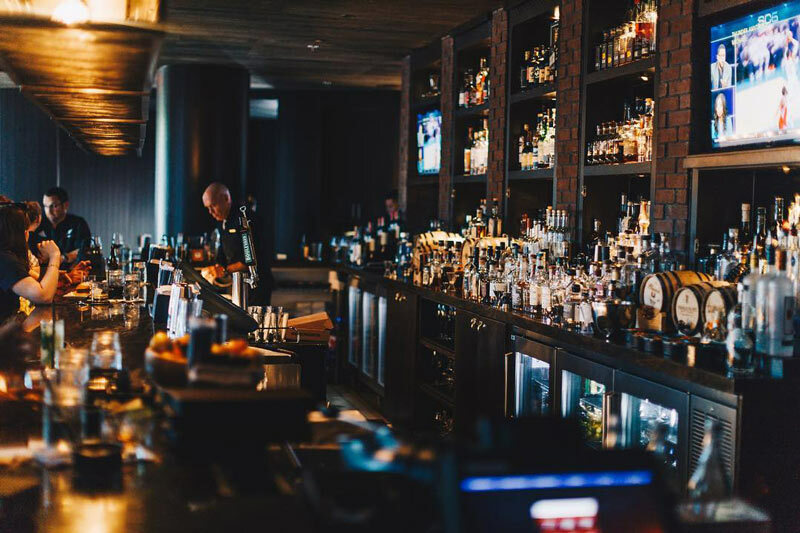 Cozy up to the exposed brick fireplace at this whiskey bar inside the Marriott Marquis for a celebratory drink or an evening of intimate conversation. The extensive cocktail list includes libations inspired by former presidents’ favorite spirits, including a heady homage to FDR, the mint julep. 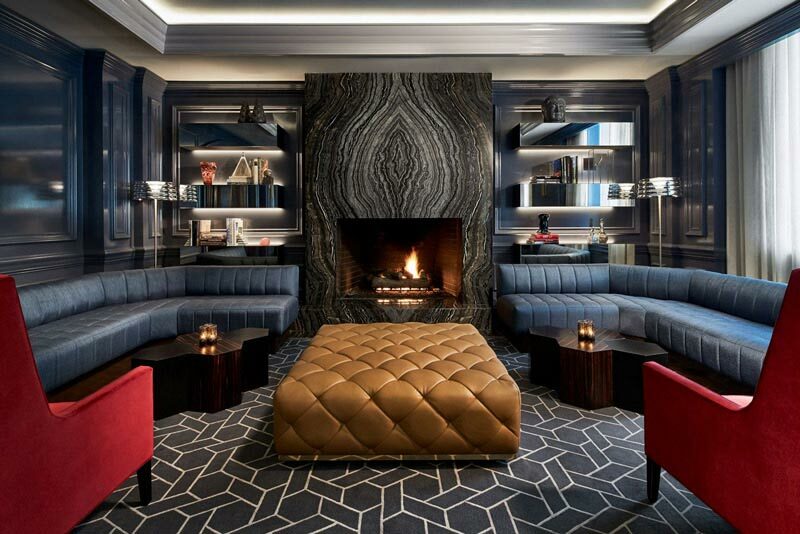 The sure-fire winner at the Pentagon-inspired fyve at The Ritz-Carlton, Pentagon City is its central fireplace, which lures locals and visitors alike in cold-weather months. 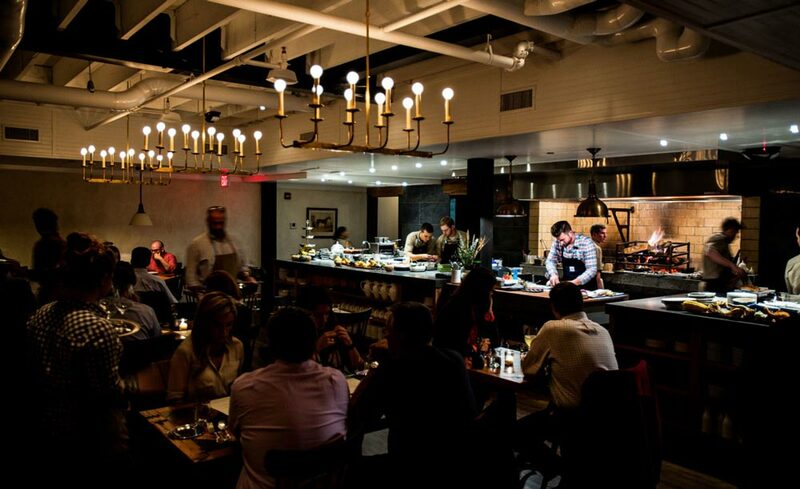 Unthaw with modern American fare where fresh, seasonal ingredients from nearby Virginia farmers and artisans are the star. And when you’re warming up by the fire getting all nice and toasty, consider this: you can come back for breakfast, lunch, dinner and brunch.